Chicken Curry recipe by Mariam at PakiRecipes.com. Add red chili, cloves, cardamom , cinnamon stick, and bayleaf , and cook until the bay leaf turns golden brown. Add the onion and fry for two minutes. Add the ginger garlic paste and fry for 4-6 minute. Add the chicken and fry for 5 minutes. Sprinkle in chili, coriander powder, cumin powder and turmeric . Cover chicken + salt (add water if needed) and cook for around 15 minutes until 3/4 cooked. Add tomato paste and cook on low heat. Just before removing, add Garam Masala and coriander leaves . 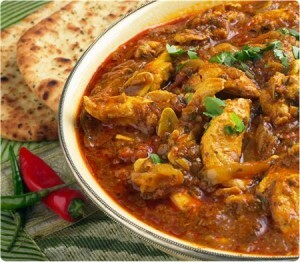 Delicious Chicken Curry recipe... simple to make. I'm trying it for the second time now. I do add chicken cubes and yogurt and it turns out really tasty. My husband liked it and i've saved it on my recipe book. just in process....brief u in an hour or so. Good simple recipe, add a chicken stock cube insted of salt and you will get a richer flavour. hi i am trying this tonight. time now is 16:00hrs wil let you know how it went later tonight. Please don't worry about typos...i have tried this recipe and it is good. thank you for this recipe Mariam and Nawed khan. 1 and 1/4 tsp, not 11 1/4 tsp! haha u idiot--chilli to taste! 11 1/4 tsp of chilli powder!!!!!!!!!!!!!!!!!!! !.r u sure???? ?tried it but my family just turned crazy on me.............gosh!!!!!!! !